Located around the intersections of Harvard Street, Washington Street and Boylston Street (Route 9) just west of the Emerald Necklace, Brookline Village is the town’s oldest shopping and business center. Originally a farming hamlet known as Muddy River, the area became a transportation hub with the construction of the Boston and Worcester Turnpike in 1806 along the current Route 9. In 1844, the town hall was relocated from the old Town Green area (around the reservoir today) to its current location on Washington Street. The area was further built-up following waves of German and Irish immigrants starting in 1848. Following the Civil War, the Village expanded up Washington and Harvard Streets. The wooden buildings lining Brookline Village were replaced with panel brick buildings. This style would become extremely popular for the commercial buildings in the neighborhood. In addition, residential properties saw an increase in development, with houses built in the Queen Anne, Colonial Revival and Shingle styles throughout Aspinwall, Kent and Cypress Streets. In contrast, triple-decker style homes were built on Boylston, Pearl and Emerald Streets. Historic firsts involving Brookline Village include the first public bath and municipal gymnasium, as well as the building of the first electric car in America in 1891 at the Holzter-Cabot Company founded by German immigrant Charles Holzter. Today, the Village is home to many restaurants, antique shops, children’s stores and cafes. It is also home to Brookline’s Town Hall, Police Headquarters and the main branch of the Brookline Public Library. Although much has changed since its inception, Brookline Village maintains the look and feel of a traditional village, blending old and new businesses into one neighborhood. 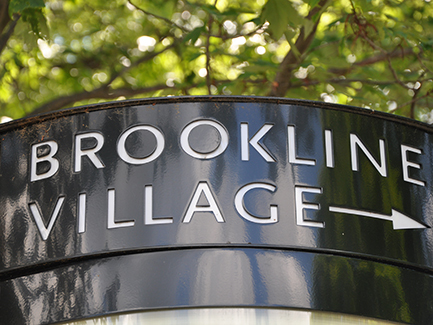 Brookline Village offers an array of places to shop. There are local book stores, spas, boutiques, and toy stores. Village Baby offers a collection of baby clothes, while Sara Belle has beautiful clothes for women. There are many services available such as cleaners, jewelers, florists, barbers, and hair salons, including Village Hair Design. Gateway Arts offers an interesting craft store and art gallery. A variety of yoga and Pilates studios are also available in Brookline Village. By subway, take the D “Riverside” train on the green line to the Brookline Village stop. The #66 bus (Dudley Station/Harvard Square) runs along Harvard Street and stops in the Village.